We have really stepped things up for 2016, This includes the legendary Mt Panorama and the Gran Prix circuit at Sydney Motorsport Park. This is one of the fastest tracks in Australia and really sets the men apart from the boys. In addition to this, they also had Trent Nolan take home 1st place in the Drivers championship in his “home built” Mitsubishi Mirage. Hot tip, don’t ever line up next to this car unless you are sporting a 500klw plus package. This little beast is running an Evo drive train and has heaps of supporting mods under the bonnet. Team SAU came within 30 points of making it 2 in a row this year, They always come home strong at the drag events, but this year held their own in the hill climb and time attack events as well. What cost them 1st place in the end was spreading the entries around the club. They didn’t collect bonus points like most of the other clubs for having 1 driver do all 4 rounds. This is something we are dropping for the 2016 series in place for vehicle classing. Regardless of this, they still had a blast and will be back for 2016 to teach those RTDC boys that it was just a 12 month lease on that trophy. These guys have been with the Nationals since day 1. A mix of the fastest street and track Honda`s in NSW. Coming 3rd this year in points and edging out a lot of higher powered cars at the drag strip really surprised a lot of people. These little front wheel drive hatch backs are looking to make it 2 better this year with a focus on taking maximum points at each round. The boys from BYP will bring their experience on car control and handling while some of the crazier members will just add more Nitrous Either way, these guys will have a lot of fun in 2016. These guys have been at the forefront of performance tuning and Motorsport for the better part of 15 years. A well established club with alot of talented drivers and even faster cars. Evo Oz is another club that have been with us since the start. George, Eric and the team have flown the Mitsubishi flag for the club at every round and placing the club in the top 3 at almost every event. 2016 will be no different, with a host of heavy hitters already confirmed. After some early struggles getting the right cars for the event, 2015 was a much better year for the Ford Owners club. A great mix of cars, drivers and performance levels. We had everything from 800hp street cars to purpose built track cars. One car that we fell in love with this year was the hand built GT40 which Jim wasn’t scared of driving. The Ford Owners club is made up of members of the Australian Ford Forums and with a great bunch of guys at the helm we are sure they will have a blast in 2016. One of the Largest clubs in Australia, the NSW arm of the HSV Owners club is another team that have been with us since day one. 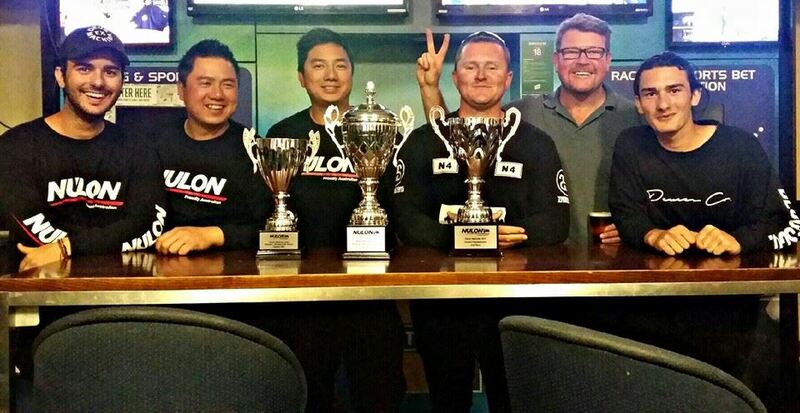 their experience in running super sprints, drag events and even charity cruises has been a great help to the team at Nulon. The event wouldn’t be what it is today without the help of Ian and the team. Now although sometimes their fastest car doesn’t have an HSV badge on it, they always turn up with the best presented cars and are very smart at matching the driver and the event. HSV Owners club managers also share the spots around with the entire club which means more people get to come and enjoy a day of racing with the Nulon Nationals. The MX-5 club have really surprised a few people in this years event, knocking off the heavy hitters in the hillcimb and Motorkhana. The level of driver is very high, match that with a well balanced chassis and these little convertibles can really slog it with the big guys on the track. All they have to do is work out what Drag racing is and they will be a top 3 team in 2016. One of the biggest things we have noticed with our event is the community of like minded car people with have brought together, MX-5 club have a huge part to play in this. Always happy to lend a hand, give feedback or simply enjoy a drink and a chat after the event. 86 (BRZ) is one of the best tuning chassis released in the Australian market over the past 10 years, RWD, great balance and a huge range of aftermarket parts make this a really fun car to own. These cars are almost perfectly suits to this style of event, They are fast around a track, fast up a hill and can smash out a motorkhana with ease. Combine that with very talented drivers in Josh Leask and Steve Pembrey and you have yourself a top 3 team. We believe 2016 is going to be the year of the 86. Watch out for these guys. They are bringing their A game. 2016 is the first year the WRX club of NSW has been selected to compete in the Nationals event in 2016. Michael and the team are not coming here to make up the numbers either. After seeing the level of cars at Subi Nats at Wakefield this year, These guys have the cars in hand to take on the Evos and GTRs in the AWD class. They are also very experienced in Motorkhanas so will collect a bunch of points there as well. We feel that the inclusion of the WRX club completes our huge variety of cars to our event, we cant wait to see what they bring next year. nlike most of the other teams, their bonnets are shut all day and they can focus on having fun at the track rather than chasing engine/gearbox/clutch/ecu/brake issues. expanding this clubs reach in 2016 will see them mix it up with the other clubs for speed at the hillclimb and time attack. The new classing system will also see them shoot up the leader board. A great team to have in the mix as they add more variety to our event. The clubs are what makes our event so fun and enjoyable, We encourage all club members to come down and get involved in our events, Driving, spectating, even helping your team with setting up a club display. This is a very low cost Motorsport event with Nulon coverage the entry costs, not charging for pit access and there is no charge to come and watch our racing.